Fatal Alliances: The Great War is a worthy partner to the international award-winning World in Flames. 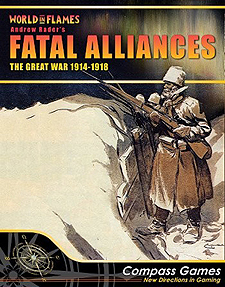 Like its predecessor, Fatal Alliances is all-encompassing, and represents every theatre and aspect of the First World War, Fatal Alliances expands upon the military system of World in Flames to highlight the diplomatic and civilian fronts. When we think of the First World War, we often think of miles of static trenches stretching along the Western Front. Indeed trench warfare was a huge component of the war, but many theatres in the Middle East, Russia, the Balkans, and even Africa were very dynamic - as even the Western Front was at times. Fatal Alliances portrays this action and focuses on the major technological changes brought on by the war, on land, at sea, and in the air. In order to prevail on the battlefield, you must coordinate artillery, elite ace-led air forces, gas units, shock troops, engineering units, infantry, cavalry, and early tanks. To guide your nation to victory, you must navigate the world of international politics, swaying both minor and major powers to your side. Can you survive civil unrest or military revolution at home, while instigating it abroad? Can you prevent your troops from refusing to fight, and maintain control of your far-flung colonies? Strategic warfare on the seas and in the air must form a vital part of your strategy, preserving your nation's own will to fight while degrading the enemy's. Whatever your strategy, Fatal Alliance: The Great War is a truly dynamic simulation of every theatre of the First World War. This is a stand-alone game - you do not need other World in Flame products to play this game.